Q&A #42 - Is Forward Navigation supported in Windows Phone? No, the forward navigation is currently not supported in Windows Phone 8. The NavigationService in the ApplicationPhonePage includes the methods GoBack () and Go Forward () but the method Go Forward () does not allow the user to do the forward navigation. 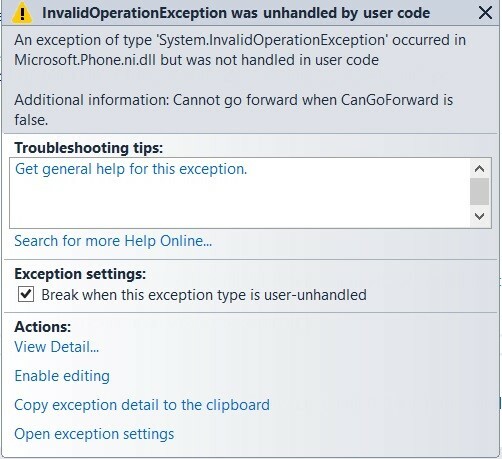 When the NavigationService.GoForward () is used, the “InvalidOperationException” is raised. Additional information: Cannot go forward when CanGoForward is false.